Martensite is a body-centered tetragonal form of iron in which some carbon is dissolved. Martensite forms during quenching, when the face centered cubic lattice of austenite is distored into the body centered tetragonal structure without the loss of its contained carbon atoms into cementite and ferrite. Instead, the carbon is retained in the iron crystal structure, which is stretched slightly so that it is no longer cubic. Martensite is more or less ferrite supersaturated with carbon. Compare the grain size in the micrograph with tempered martensite. The difference between austenite and martensite is, in some ways, quite small: while the unit cell of austenite is a perfect cube, in the transformation to martensite this cube is distorted so that it's slightly longer than before in one dimension and shorter in the other two. The mathematical description of the two structures is quite different, for reasons of symmetry, but the chemical bonding remains very similar. Unlike cementite, which has bonding reminiscent of ceramic materials, the hardness of martensite is difficult to explain in chemical terms. The explanation hinges on the crystal's subtle change in dimension, and the speed of the martensitic transformation. Austenite is transformed to martensite on quenching at approximately the speed of sound - too fast for the carbon atoms to come out of solution in the crystal lattice. The resulting distortion of the unit cell results in countless lattice dislocations in each crystal, which consists of millions of unit cells. These dislocations make the crystal structure extremely resistant to shear stress - which means, simply that it can't be easily dented and scratched. Picture the difference between shearing a deck of cards (no dislocations, perfect layers of atoms) and shearing a brick wall (even without the mortar). This article is licensed under the GNU Free Documentation License. It uses material from the Wikipedia article "Martensite". Face Centered Tetragonal image from the Wikipedia article "Crystal structure". 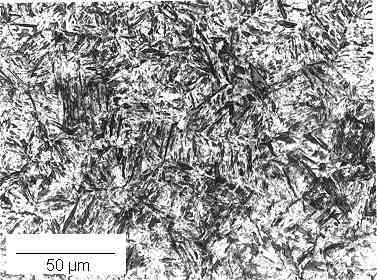 Martensite Photomicrograph Copyright © British Steel; Used with permission, Courtesy of Corus. Copyright © 2006 Peter L Berglund. (except for Martensite photomicrograph) Permission is granted to copy, distribute and/or modify this document under the terms of the GNU Free Documentation License, Version 1.2 or any later version published by the Free Software Foundation; with no Invariant Sections, no Front-Cover Texts, and no Back-Cover Texts. A copy of the license is included in the section entitled "GNU Free Documentation License".